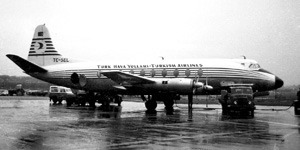 The 1959 Turkish Airlines Gatwick crash was an air disaster that occurred on 17 February 1959, near London Gatwick Airport (IATA: LGW, ICAO: EGKK). A Turkish Airlines Vickers Viscount Type 793 with registration TC-SEV on an international charter flight from Esenboğa International Airport (IATA: ESB, ICAO: LTAC) in Ankara, Turkey, to London Heathrow Airport (IATA: LHR, ICAO: EGLL), United Kingdom, carrying the Turkish prime minister and a party of government officials, crashed in a wood 3 miles (4.8 km) from the threshold of the runway during its final approach to land in extensive fog. Five of the eight crew and nine of the sixteen passengers died in the crash. The prime minister was among the ten survivors. Turkish Prime Minister Adnan Menderes has survived an air crash near London that killed 12 people. Mr Menderes was on his way to the British capital for talks on Cyprus with the British, Greek and Cypriot premiers when his Viscount jet crashed in Jordan's Wood, near Newdigate in Surrey. Only 10 of the 22 passengers and crew on board the Turkish Government aircraft survived and two were critically injured. The latest weather report for Gatwick was given as wind calm, visibility 1.1 nm, mist, cloud 3 oktas at 600 feet, QFE 1036 mb. Over the Mayfield NDB at 4,000 feet the flight was instructed to steer a course of 280 and to descend to 2,000 feet. This was acknowledged. A further descent clearance was given to 1500 feet. 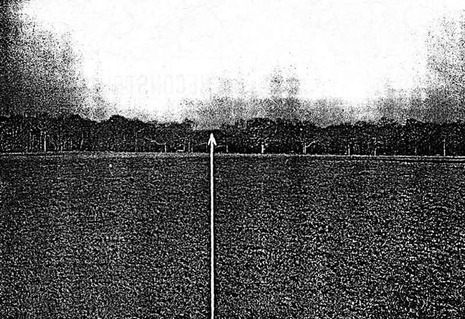 The aircraft overshot the centre line slightly as it turned on to the ILS approach path. At 5nm from touchdown, the aircraft affirmed that it could continue on the ILS. TC-SEV was then asked to change to tower frequency and this request was acknowledged. This was the last communication with the aircraft. At a position of some 5 km from the runway threshold and 550 feet to the north of the approach path centre line, the aircraft contacted tops of trees 390 feet amsl at the edge of Jordan's Wood. The aircraft began to disintegrate as it descended through the trees at an angle of about 6 degrees from the horizontal until the wheels made contact with the ground. After rising again slightly the main part of the wreckage came to rest about 100 yards further on and then caught fire.